This page contains brief history about my country. I love my country very much. It represents my feelings for my great country and for my responsibilities to this world that Almighty has created. I pray for world peace. India can legitimately claim to be a grand old civilisation in terms of its philosophy, tradition and culture of peaceful co-existence and unity in extreme heterogeneity. It has given a cultural mosaic, where all segments have contributed to the growth of fused and balanced ways of expression and behaviour. It has also made a mark as a nation in adopting a liberal democratic and secular Constitution. Indian Constitution for the first time in history of India addresses Indian citizens in the name of "We, the people of India". The political system commits to ensure equality, liberty, fraternity and justice to all. Thus, India as a civilisation and nation manifests a high quality commitment to equality, tolerance, rule of law and secularism. Although India occupies only 2.4 percent of the world's land area, it supports over fifteen percent of the world's population. Only China has a larger population. Forty percent of Indians are younger than fifteen years old. About 70 percent of the people live in more than 550,000 villages, and the remainder in more than 200 towns and cities. Religion, caste, and language are major determinants of social and political organization in India today. The government has recognized sixteen languages as official; Hindi is the most widely spoken. Although 83 percent of the people are Hindu, India also is the home of more than 120 million Muslims, one of the world's largest Muslim populations. The population also includes Christians, Sikhs, Jains, Buddhists, and Parsis. Indeed, one of India's great legacies is the fact that it is the birthplace of both Hinduism and Buddhism. The population of India has a life expectancy at birth of 63.4 years (62.54 for males, and 64.29 for females) and an infant mortality rate of 60.81 deaths/1,000 live births. In terms of literacy, 37.7 pecent of the female population and 65.5 percent of the male population, age 15 and over, can read and write. The people of India have had a continuous civilization since 2500 B.C., when the inhabitants of the Indus River Valley developed an urban culture based on commerce and sustained by agricultural trade. This civilization declined around 1500 B.C., probably due to ecological changes. During the second millennium B.C., pastoral, Aryan-speaking tribes migrated from the northwest into the subcontinent. As they settled in the middle Ganges River Valley, they adapted to antecedent cultures. The political map of ancient and medieval India was made up of myriad kingdoms with fluctuating boundaries. In the fourth and fifth centuries A.D., northern India was unified under the Gupta Dynasty. During this period, known as India's Golden Age, Hindu culture and political administration reached new heights. Islam spread across the subcontinent over a period of 500 years. In the 10th and 11th centuries, In the early 16th century, descendants of Genghis Khan swept across the Khyber Pass and established the Mughal (Mogul) Dynasty, which lasted for 200 years. From the 11th to the 15th centuries, the Hindu Chola and Vijayanagar Dynasties dominated southern India. During this time, the two systems, the prevailing Hindu and Muslim religions, mingled, leaving lasting cultural influences on each other. The first British outpost in South Asia was established in 1619, at Surat on the northwestern coast. Later in the century, the East India Company opened permanent trading stations at Madras, Bombay, and Calcutta, each under the protection of native rulers. The British expanded their influence from these footholds until, by the 1850s, they controlled most of present-day India, Pakistan, and Bangladesh. In 1857, a rebellion in north India led by mutinous Indian soldiers caused the British parliament to transfer all political power from the East India Company to the British Crown. Great Britain began administering most of India directly while controlling the rest through treaties with local rulers. In the late 1800s, the first steps were taken toward self-government in British India with the appointment of Indian councilors to advise the British viceroy and the establishment of provincial councils with Indian members; the British subsequently widened participation in legislative councils. Beginning in 1920, Father of Nation, Mahatma Gandhi, transformed the Indian National Congress political party into a mass movement to campaign against British colonial rule. The party used both parliamentary and non-violent resistance and non-cooperation to achieve independence. 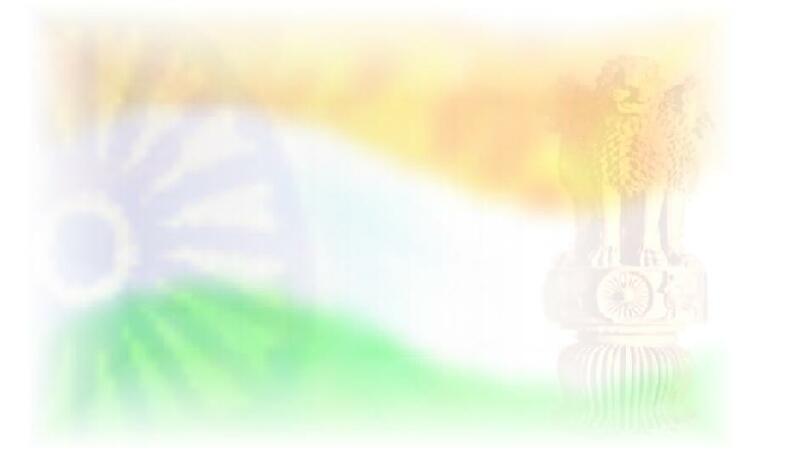 On 15 August 1947, India became a dominion within the Commonwealth, under Prime Minister Jawaharlal Nehru. India became a republic within the Commonwealth after promulgating its constitution on 26 January 1950. After independence, the Congress Party, the party of Mahatma Gandhi and Jawaharlal Nehru, ruled India under the influence first of Nehru, and then his daughter and grandson, with the exception of two brief periods in the 1970s and 1980s. Prime Minister Nehru governed the nation until his death in 1964.
and composed by the Nobel laureate Rabindranath Tagore on January 24, 1950.
as the Government may authorise as occasion arises, ..."
Only the first of the five stanzas was designated as the anthem. Of the Dravid, and Orissa and Bengal. INDIA means - Intelligent Nation Developing In All Fields. What Is India Vision 2020? India is my country, all Indians are my brothers and sisters. I love my country and I am proud of it's rich and varied heritage. I shall always strive to be worthy of it. There is no Law higher than Truth. Nation is Bigger than the Individual. Never go against the Law of the Land. Respect the Freedom of others and Love all. Have and cultivate Love for God and Fear of Sin. Abhor Sin. Keep your house and surroundings clean for this will promote hygiene and health and help you. Curb envy and jealousy expand your vision and outlook; treat all equally regardless of caste, creed and religion. Practice charity, but do not encourage beggars by giving money. Provide them with food, clothing and shelter. Help them in other ways but do not encourage laziness. Have patriotism to your Nation - but do not criticise other Nations or put others down. Not even in your thoughts or dreams should you think of bringing grief to your country. I solemnly pledge to work with dedication to preserve and strengthen the freedom and integrity of the nation. I further affirm that I shall never resort to violence and that all differences and disputes relating to religion, language, region or other political or economic grievances should be settled by peaceful and constitutional means. In there well being and prosperity alone lies my happiness. I appeals to all my fellow citizens to Safeguard Peace, Communal Harmony, Religious Tolerance and Secularism to defend Democratic Values, The Constitution and the Rule of Law. I let it be affirmed here once again: India is going to be the new power in the world, whether any nation likes it or not. And slowly but surely, this is coming to be acknowledged quite rightly. I can proudly say: "SARE JAHANSE ACHCHA HINDUSTAN HAMARA" It would be the truth and not just a boast. I pray Almighty God that it also joins the list of developed nations very soon. I MAKE MY INDIA SHINE. JAI HIND!